There are many things people get excited about when the holidays come around each year. For some it is the snowball fights, for others the smell of pine trees in the living room, for me it is the heightened availability of Bloomer Candies’ Vanilla Cream Peanut Clusters. It is no secret that I love candy. K once said, “If you are what you eat, someday you are going to turn into a Gingerbread man!” I like many kinds of candy but one of my favorite favorites are these delicious vanilla cream and peanut confections coated in delicious milk chocolate! They aren’t readily available the rest of the year and I judge the start of the holiday season by the appearance of the display stack at the grocery store. They used to come in pint containers that looked like ice cream pints, but this year they are in a cardboard box like fine pastries. I am not a fan of caramel clusters because I hate getting the caramel stuck in my teeth (especially when I had braces), and because they are often too sweet and give me the “sugar shivers”. 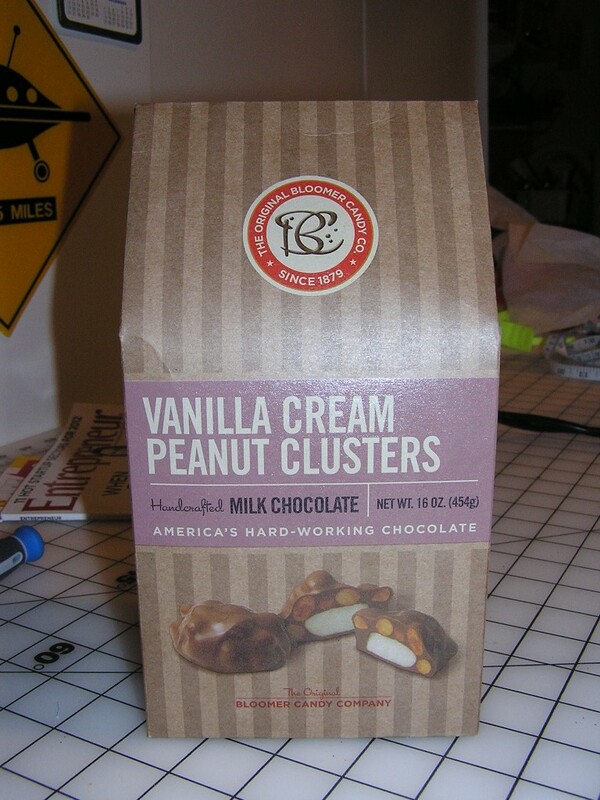 The vanilla cream peanut clusters by Bloomer Candies are just the right amount of sugar rush without the sticky mess. I just love them! They are made with all natural ingredients and no preservatives. They make their candies in small batches using the same family recipes used since the Civil War. One of the things that makes me happiest about buying these every year is knowing I am supporting a small, family-owned, Ohio-based business that takes pride in its products and honors the traditions that were started when the company was founded in 1879, 100 years before I was even born. To learn more about the Bloomer Candy Company, visit their website, where you can order your own and find your very own favorite… oh, and support American workers at an American company, making an American product.